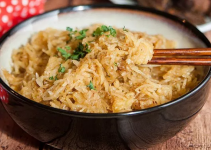 Cauliflower has never tasted so good! 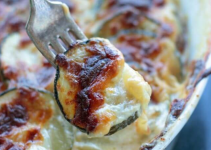 This Baked Cauliflower Casserole gets a hit of tangy flavor from melted goat cheese. On a baking sheet, combine the cauliflower florets, olive oil, oregano, salt and pepper. Toss to coat. Roast until the cauliflower is barely tender when pierced with a fork, turning occasionally, about 25 minutes. Lightly coat a 7- by 11-inch baking dish with cooking spray. 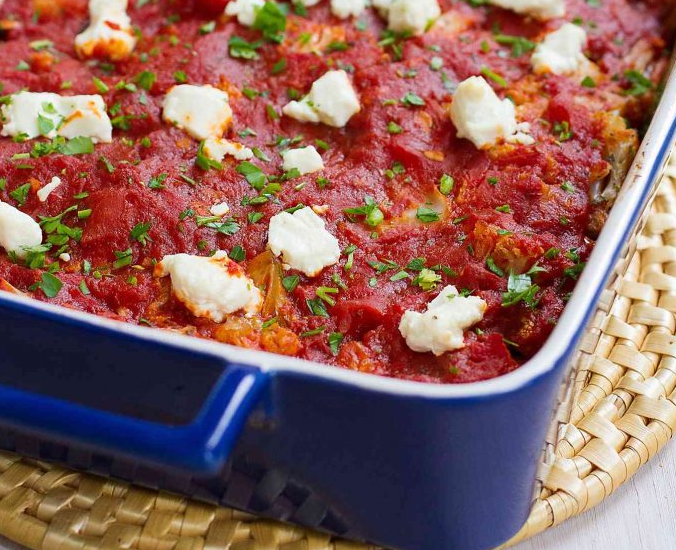 Place the roasted cauliflower in the baking dish, and top with the marinara sauce and crumbled goat cheese. Bake until the cauliflower is tender and the goat cheese is melted, about 20 minutes. Serve. 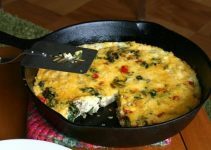 Heat the olive oil in a large nonstick skillet set over medium heat. Add the garlic and cook for 30 seconds, stirring constantly. Stir in the crushed tomatoes and bay leaves. Bring to a boil, then simmer for 15 minutes. Remove and discard the bay leaves. Stir in the salt and parsley.